Ideal for connecting USB 3.0 enabled PC peripherals such as printers, hard drives, network hubs and etc. USB 2.0 Version Computer USB to VCR Camera Cable. USB Type A Male to USB Mini B 4 Pin Male. Transfer rates up to 480Mbps depending on USB version. Compatible with USB specifications 1.0; 1.1; and 2.0. Gold Plating Contacts. UL TYPE AWM 2725 28AWG. Length: 15 Feet. Ideal for connecting your PC or Mac to any peripheral device such as your printer, scanner, or hard drive enclosure that require an A-Male device connection. Support data transfer rate of up to 5Gbps (Super Speed). This USB Type C cable is used to connect your peripheral devices like mouse, keyboards and more to your portable electronics such as cell phones, eReaders, tablets, and laptops with this USB Type C cable. The USB Type C connector is is reversible and can be plugged in any orientation. Ideal for connecting PC to mobile devices such as phones, mp3 players, cameras, etc. Ideal for extending your USB cable. Plug and play. 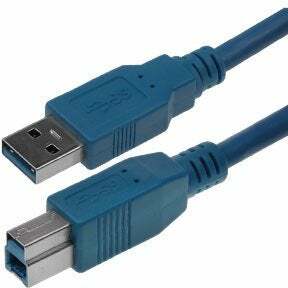 USB 3.0 cables are over 10 times are fast as USB 2.0 and is used to connect devices together such as PC to printer, camera, scanners, and mobile devices. The connections made by USB 3.0 include USB A, USB B, micro USB, and extension. Our range includes various combinations of extension cables in different lengths, USB 3.0 male to male and micro male cables in different combinations, etc. All our products are available at very competitive prices with uncompromised quality. We only offer RoHS compliant products which are safe to use and environment friendly. You can also expect good after sales service and lifetime technical warranty on the purchased products.